“Every corner,” Istook said after examining the battered bodywork on his No. 11 RS Werkes Racing Audi RS3 LMS. 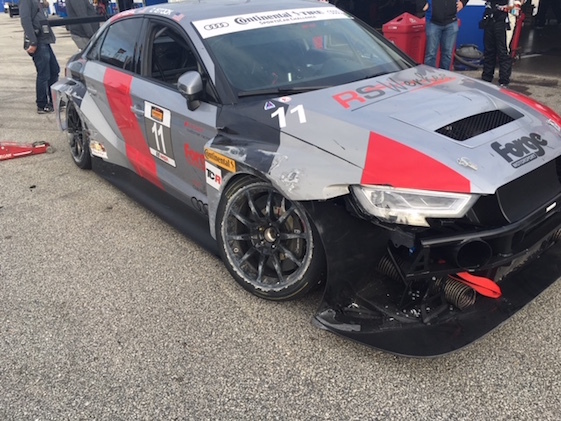 “Well, the left rear (panel) is OK,” said JT Coupal, the 17-year-old who was behind the wheel when contact with another young driver eliminated both from Friday’s 2018 season-opening BMW Endurance Challenge at Daytona, season-opener of the IMSA Continental Tire SportsCar Challenge series. Coupal was running 33rd in a field of 41 and sixth among seven entries in the new-for-2018 TCR class with approximately 1 hour, 23 minutes remaining in a four-hour sprint when he and Nathan Stacy’s No. 60 Roush Performance/KohR Motorsports Ford Mustang GT4 invaded each other’s space. 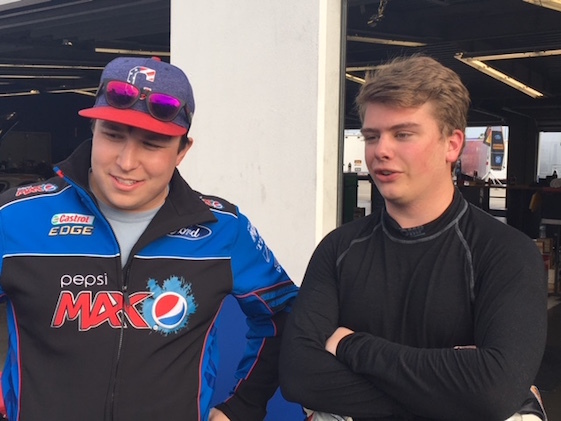 “We were going through (turns) 3 and 4,” said Coupal, who had qualified the car 33rd with a lap around DIS’ 3.56-mile/12-turn “roval” layout in 2 minutes, 02.573-seconds/104.553 mph. “I had been down on the bottom and was beginning to move up because that’s the line as you come up this track a little bit. So I was like one lane up from the bottom, my normal line there. You’re supposed to go on the outside to pass there and I guess he decided to go on the inside, which I wasn’t anticipating. I was there specifically for him to go on the outside of the exit. He decided to go to the inside, which was fine, but I didn’t have enough time to react to him coming close to me. The damage to the Audi owned by Don Istook was extensive. 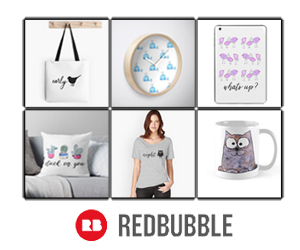 terrible, to be honest,” said Coupal, a senior at Allendale Columbia High School in Rochester, N.Y. “We made a change and that made the car much better. Put fresh tires on the front, made some changes to the rear and it was handling much better. Then we had some penalties that I don’t understand. We did another stop because the tires were worn but it was still quick. That is one of the aims behind a series featuring cars classified as Grand Sport, Street Tuner and Touring Car Racing in support of the IMSA WeatherTech SportsCar Championship. Continental Challenge features a mixed grid of proven sedan racing pros like pole and race-winner Spencer Pumpelly, NASCAR ladder-climbers like Austin Cindric and Chase Briscoe, gentlemen drivers like Istook and ever-eager teen-agers like Coupal and Stacy. The 10-race series includes entries from the winning Porsche Cayman GT4 MR to street-stock appearing BMW M4s, Mustangs, Mercedes-AMGs, Volkswagen Golf GTIs, MINI John Cooper Works, Aston Martin Vantages and the factory-built Audi RS3 LMS competing in TCR. Audi historically has fared well in touring car series that promote the “sportiness” of four doors, and the RS3 LMS carries on that tradition of family/performance-oriented entry-level customer sedan. The car and its strengthened production steel body with welded steel roll cage is eligible for TCR series worldwide. Power is provided by a 2.0-liter, straight four-cylinder engine featuring turbocharger and inter-cooling, transversally mounted ahead of the front axle. According to Audi, the engine produces 330 horsepower at 6,200 RPM mated to a six-speed sequential transmission. Istook, who has prepped and raced a number of Porsche and Audi models in various series, took delivery of the sliver RS3 in November. Displayed in the showroom of Audi Fort Worth, where Istook is employed as Audi Sport Ambassador, the car was a customer magnet. That also was the case when Istook accompanied the car to the annual DFW Auto Show in Fort Worth in December. 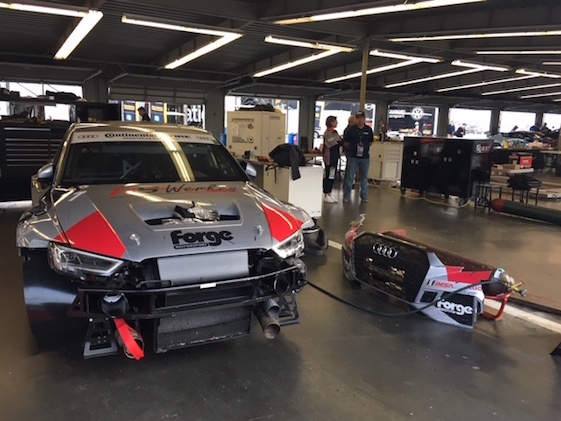 Broken expensive parts surround Don Istook’s formerly new Audi in the Daytona International Speedway garage. Vegas and struck-up a one-race deal for Daytona. Coupal drove an RS3 in the Pirelli World Challenge series last year, and wheeled an SCCA Spec Miata in 2016. Coupal was classified as finishing 37th after completing 63 laps with a best lap time of 2:02.426-seconds at 104.678 mph. Winning co-drivers Pumpelly and Dillon Machavern completed 106 laps with a best circuit of 1:56.276-seconds/110.215 mph in their No. 28 Porsche Cayman competing in Grand Sport. For further comparison, the highest-finishing of the Audi RS3 LMS entries was piloted to a 19th-place result shared by Britt Casey Jr. and Tom Long of Canada’s Team Compass Racing. Their best lap was timed in 2:01.010-seconds and 105.903 mph. 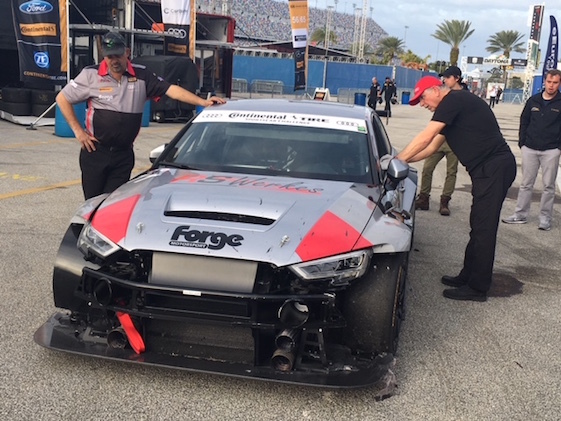 JT Coupal, right, surveys the damage to the Audi he drove at Daytona. “Nate” Stacy is the product of a family of racers based in Owasso, Okla. Istook, 66, said Stacy’s version of the accident charged Coupal with moving down the banking and initiating the contact that shot the latter into the outside wall, tearing up the bodywork, wheels, tires and suspension on the car’s right side as well as the front splitter and left front fender and suspension. Istook put the price tag on his Audi as the day started at $150,000, not counting the rig and trailer he also purchased to haul the car, its support equipment and hired crew to each race venue. Audi Club North America officially is sponsoring the car. “It’s not a lot but it’s still Audi Club North America, which could lead to more sponsorship _ at least that’s what I hope,” Istook said. “So we had a lot of Audi fans at this race and there’ll be pictures on the web…which is not what we wanted but that’s going to happen. Istook already has paid IMSA’s entry fee for the entire 10-race season, and said he recently was approached about returning to the Pirelli World Challenge schedule that begins a little less than two months at Circuit of The Americas in Austin, Texas. “Racing in PWC, there were some ways that could financially happen,” said Istook, who praised the three-man crew from Forge Motorsport for providing financial support to him and crew chief Phillip Wight of River Oaks, Texas. “They all worked their tails off for us this week,” Istook said. Wight operates an auto shop in Arlington, Texas, and Istook said the car might get repaired there prior to Round 2 of the series at Sebring (Fla.) International Raceway. The two-hour Sebring 120 is a support event for the Mobil 1 Twelve Hours of Sebring set for March 14-17 on an historic 3.74-mile layout. “As far as me not getting to race here, I kept JT in the car because I want him in the car as much as he could get,” Istook said. “We had planned in about 30 minutes to stop and I’d get in and drive the last hour. So he’d get his money’s worth and get accolades as he drove the car more than I did. It’s not about me driving the race car. If I would have had two drivers paying me, I would not have even driven the car.